This was by far the easiest Index of Effluency decision in the history of the 24 Hours of LeMons. 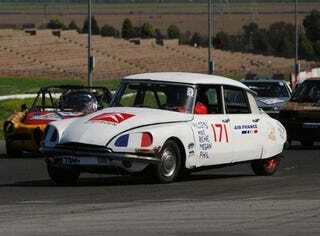 The Team Air Prance Schitroën Citroën DS was purchased for 300 bucks not long before the race. It had been sitting for 20+ years, which would be a challenge for a Dodge Dart but is utter lunacy for a vehicle as complex and with as many hydraulic fittings and seals as a DS. The team thrashed on it in a panic for weeks prior to the race and got it 95% ready by the weekend, but it had still not driven under its own power since the 1980s as of Friday afternoon. Then, success! It started and drove a single lap around the paddock. You know how this story ends, right? Saturday morning, the Citroën hits the track… and shoots a rod through the hood within 200 yards. Mais non! Pas du tout! * It had to pit a couple of times for brief repairs and adjustments, but otherwise spent the entire weekend going around and around and around Infineon Raceway. It is impossible to overstate the magnitude of this accomplishment, folks. Congratulations to our first-ever two-time Index of Effluency winner. First with a '62 Mini, now with a '72 Citroën! *Translation: But no! Not at all!